The app, called Bump Pay, builds on the company's core technology, which enables two smartphones using Bump apps to transfer data by being tapped together. Unlike NFC (near-field communication), which Google and others are promoting for mobile payments, Bump requires physical contact between devices. The company's current app, called Bump, allows users to transfer contact information and photos. 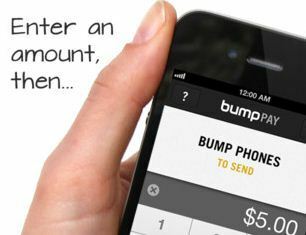 To use Bump Pay, a user types in how much money he or she wants to send and then bumps phones with the intended recipient. Bump's software determines which two phones collided. The app then transfers funds from one user's PayPal account to the other's. Both users must have previously downloaded the app and linked it to their PayPal accounts. "Bump Pay is interesting because of its novelty, which may spur trial, but being within arm's reach of the person you're paying back is not always convenient and will limit its usefulness," said Denee Carrington, an analyst with Forrester Research. But Chris Silva, an Altimeter Group analyst, sees proximity as the right approach in the U.S., "where people are just so paranoid about using any type of technology where there's a transaction taking place and you're not actually exchanging funds or a card." "I think it makes sense for what people are going to feel comfortable using," Silva said. As for the security of the app, Silva noted that some Bump Pay users could claim that they had accidentally tapped another person's phone, and thus attempt to recoup their funds. "There's a risk, but it's almost completely borne by the credit card issuers and the banks who are going to be stuck arbitrating those disputes."